I don’t know where they get these pig’s ears but they are huge. Do they use steroids or what? I use to buy these pig’s ears for one of my dogs. He loved them but then he had to pee about 20 times a day, actually mostly at night. At first, I was cutting them in two with my metal cutters, then I figured out that the butcher could saw them in two in less than two seconds with their band saw. I know that some people say that you shouldn’t give dogs the pig’s ears because of the salt, the fat and all the hormones that they stuff into those pigs. 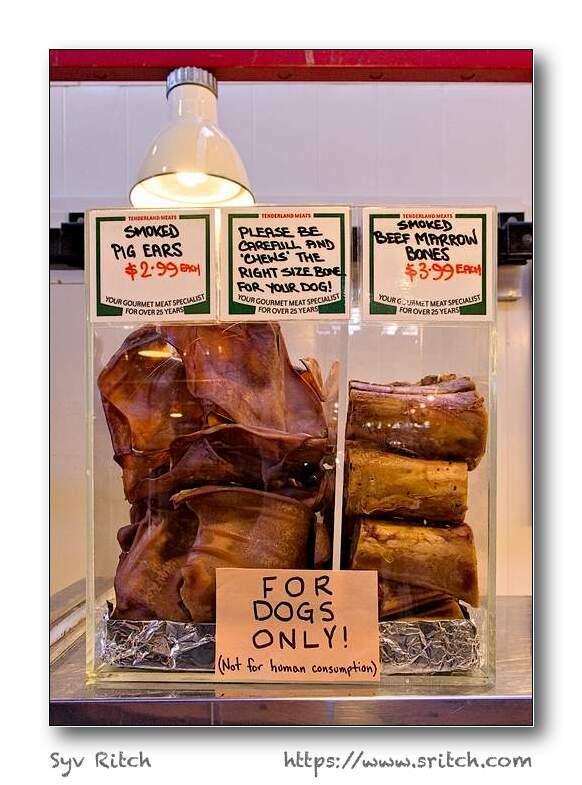 I asked one of the butcher about the “For Dogs Only” sign and he said that some people used to buy the pigs ears and boil them, then they would complain about the taste.